You’ve probably heard of Invisalign, whether it was on a TV commercial, a sign in your dentist’s office, or elsewhere. It is often advertised as an orthodontic solution for busy adults who want to achieve a straighter smile without the disadvantages of metal braces. But did you know that teenagers can also benefit from Invisalign? There are many similarities and a few differences between regular Invisalign and Invisalign Teen. Most people’s mouths aren’t fully developed until they’re in their late teens or even their early 20s. Therefore, Invisalign Teen has to account for the changes that are still taking place in adolescents’ mouths. That’s why aligners for teenagers allow space for new teeth, particularly the molars, to continue to develop and grow in. Invisalign Teen also has “power ridges” that can move the roots of growing teeth, helping those teeth to erupt in the correct place. It’s often possible to prevent misalignment problems with these teeth even before they begin. Of course, no one should begin Invisalign treatment before their mouth is ready. This treatment is not a Phase One procedure (Phase One orthodontics are a special treatment for children who don’t have all their permanent teeth yet). Therefore, teenagers should wait to start Invisalign until their second molars have erupted. In most cases, this happens around the age of 13. Anytime after that may be the right time for teens to start Invisalign and get on the path to a straighter, healthier smile. Some teenagers are very responsible and conscientious individuals who diligently do their best to wear their Invisalign aligners for the recommended 20 – 22 hours per day. Others are still working on their self-discipline and might need some extra encouragement to keep pace with their treatment. Invisalign teen features compliance dots on the aligners. As a parent, you can simply glance at the dot and discover whether your teen has been wearing it enough for it to effectively do its job. If you discover a problem, you and/or the orthodontist can talk to your teen about it and hopefully get the issue corrected before they end up jeopardizing the long-term success of their treatment. Of course, you know your teenager, and if you suspect they might not be compliant with their treatment from the start, you might want to look into getting traditional braces for them instead. Each Invisalign aligner is specifically designed to get its wearers teeth a little closer to their ideal positions. However, sometimes an incident may occur that damages an aligner so it is no longer wearable. For example, someone might forget to remove their aligner when they’re sipping a hot beverage and accidentally warp their Invisalign tray. If something similar happens to your teenager, there is no need to panic or despair. Invisalign Teen comes with up to six complimentary replacement aligners, so if there is an incident, all you have to do is get in touch with the orthodontist, who will be able to help get the treatment back on track in no time. Keep an oral hygiene kit (with a toothbrush, toothpaste, and floss) in your backpack so you always have it with you at school. You’ll have to give your smile and your aligner a quick cleaning after every meal. Communicate with your parents and orthodontist. If you run into any problems — for example, if an aligner causes you abnormal pain — be sure to let someone know. Sometimes an aligner needs to be adjusted slightly so it’s as comfortable as possible. Remember that Invisalign isn’t the same thing as a mouthguard. If you play sports, remove Invisalign during practice and wear a sports guard instead so you can protect your teeth against damage. Practicing speaking. When you first start wearing Invisalign, you might notice that it’s a bit more difficult for you to speak clearly. You should get over this fairly quickly if you keep your aligner in your mouth and practice talking or reading out loud. Wear your retainer. After you finish with Invisalign, you’ll have to wear a retainer for several months (or perhaps a few years) so your teeth don’t drift back out of place. 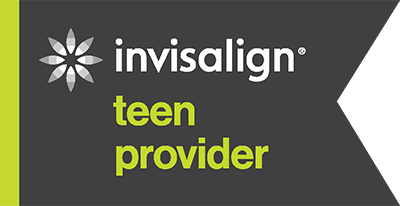 If you are a parent who is interested in getting Invisalign for your teenager, please don’t hesitate to contact us to schedule a consultation. During the appointment, we will examine your adolescent’s mouth and take some images in order to become familiar with the orthodontic issues that need to be corrected. We’ll also talk to you and your teen about the responsibilities and rewards that come with Invisalign. Together, we’ll decide on a treatment plan that will get your son’s or daughter’s smile on the path to optimal health and beauty. Invisalign Teen is a remarkable treatment that lets young people attain a straighter smile without the social stigma of traditional braces. We look forward to helping your family benefit from this innovative system!